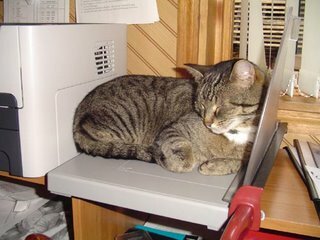 Well, here is a picture of the real boss of the place, Gosha. 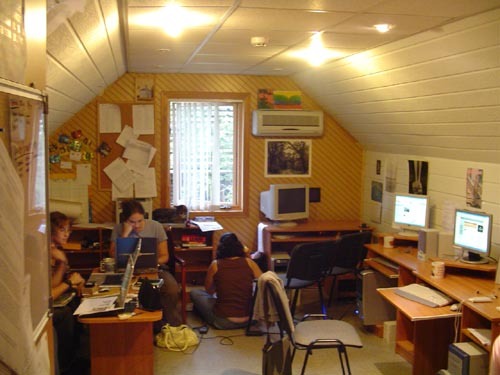 And the teachers' office where we spend most of our time, working hard. So, without benefit of a drum roll....I got three AIs and a BI, which are third and fifth semesters at the American Home. Not all of them come in at the lowest level. Some of them have study in school and want the extra practice. Some of them studied when they were in the school and want to brush up again. Actually, I am really looking forward to it. It's going to be a great time! Well, today is Friday. Unfortunately, out picnic for tomorrow is shut down because of a strong chance of rain. Hopefully the weather will premit it some time soon. Hope everyone has a great weekend! I don't know if it was covered much by the media in the US, but there was a plane crash on Tuesday in Ukraine. A Russian plane with tourist returning from a Black Sea resort crashed due to bad weather. It was all over the news here and a lot of people were understandably shaken up by it. 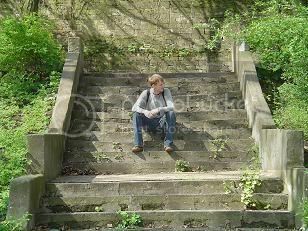 Well, today is another typical day, so I thought I would describe it to give you all an idea of what exactly it is that we are up to here. Right now, we are doing orientation, workshops and such, so our schedule will change in a few weeks when we start classes. In the morning, I wake up and get some breakfast, which my host mother has mostly ready by the time I wake up. I usually get kasha or some eggs with hot tea, although occassionally I get hot chocolate instead. Usually there are vegetables, bread, and cheese too. After that its time to get ready and then head to the American Home. I usually take a bus which takes about ten minutes, but it only takes about thirty-five minutes to walk. The bus drops me off in front of the Golden Gates, one of the oldest buildings in the city and among the oldest in Russia. It was once the main western gate of the city's kremlin when Vladimir was the political center of Russia some seven-hundred years ago. The gate and a short section of earthen wall that stand next to it in the center of town are all that's left of the walls. It is only a short walk, about a block, to the American Home. As you might imagine, it looks outside and in like a typical suburban house. It was built almost 15 years ago as a center for American culture and learning as well as an outreach to local business. Now its main service is our English language program. Right now, we split our time at the American Home between four main activites. The first is learning about the program and how best to teach English to Russians. We are taught by Lena, a Russian staff member, and Joanna, the lead teacher, who was here last year. We also spend a lot of time in the teachers' office, a room with computers, a printer, copier, and a whole wall of bookshelves filled with English instruction books and materials. This is where we work, hang out, goof off, and many other things. We also spend considerable time sitting at the kitchen table drinking tea and talking amongst ourselves and with the Russian staff. Lastly, a couple of evenings a week, we have new students who come to take a placement test. We give them a short test of speaking and listening skills, grade their written tests, and try to place them in one of the levels, from begining level ZI, to the intermediate levels like AI-II, BI-II, all the way up to the advanced D level. After these duties are complete, we return to our host families for dinner. Dinner always consists of soup, with some sort of meat and vegetable to go along with it, and usually potatoes or pasta. Often I sit with my host mother and drink tea talking about the news, events, Vladimir, Russia, America, or about any thing else that comes up. After dinner, I usually sit down to read, listen to music, write, or whatever else I want to do for a while before bed. When wqe have time, we have different things to do. There are several cafes that we can visit, and while the weather is still warm, it is nice to sit outside. We also have lots of movies and other DVDs to get into a group and watch. While the weather is nice, we enjoy going outside and enjoying the AH's spacious back yard, throwing a frisbee or tossing a football around. That's pretty much it...I'm sure in due time we will find more things to do for entertainment, but for now, this is the routine! Well, today's exciting news isn't so exciting as it is lucky. We arrived to work at the American Home this morning to discover that the restaurant next door had a fire over night. Lucky for them the damage doesn't look too bad because it seems to be only in the attic and roof area. It was also lucky for us because it is only about ten yards from the American Home, and as you might imagine, no American Home = no jobs for us. That was our excitement for the day, other than that we are still hard at work planning and learning. I think we are all eagerly anticipating the start of classes, even if we are a bit nervous. While wandering the internets, I came accross an interesting story on the BBC. Who would have thought, Russians running low on alcohol? There is an interesting thought or two in here about the motivation for the new restrictions. Plus, its not the first time that the governement has attempted to use booze for political gain, just ask the Gerogians and the Moldovans. 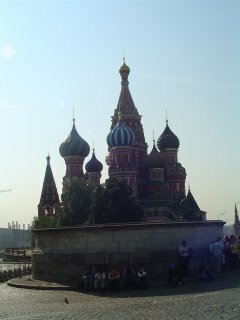 As promised, here are a few pictures from the trip to Moscow. 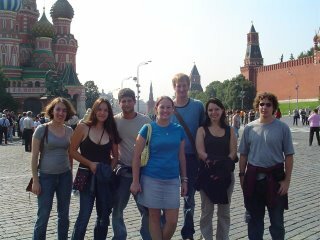 Well, we all survived our day trip to Moscow despite some very earnest efforts by Eric and Nicle to miss the train. We left Vladimir on the 7:30 am electric train that takes about two and a half hour trip to Moscow. We arrived and braved Msocow's fiendishly complex subway system to Red Square. Beleive it or not, it was actually quite hot in Moscow in August, so we were all quickly looking for someplace to buy some water or ice cream. After taking in Red Square we began to wander in the direction of Lenin's Tomb and toward the Novy Arbat. Unfortunately, we discovered that the line to see him stretched for what seemed like half a mile. Someone commented that it looked like a line at Disney World. After some more walking, we settled in for some lunch, followed by a leisurely walk to the Tretyakov Gallery, a famous museum whaich was founded in the late 19th century by a wealthy merchant. It is packed with all sorts of art from early Russian icons to avant garde art from the teens and twenties. Our last stop was a large three storied mall for a trip to a stand in the food court that sells blinni, a Russian favorite that is like pancakes, but can be stuffed with sweets or meat and cheese for a tasty meal. The trip back was pretty uneventful, mainly trying to sleep on one of the most uncomfortable seats I have ever sat in. Lastly, we arrived back in Vladimir in the middle of a full-blown thunderstorm with water pouring down the streets. Today we have some free time, although most of us are spending the day on various American Home related activities. Hopefully tonight we will get the chance to have some fun with movies or something along that line. After the first week, things are going great, but we can all tell that this is going to be a lot of work. There are lessons to prepare, classes to teach, movies to show, converstation classes to organize, and a host of other things. This is not to mention the navigation of a sometimes mystifying society and its traditions. Well, time for a late week update. Things are going great. We are spending a lot of time learning how best to teach English. The staff is great and we are learning a lot. 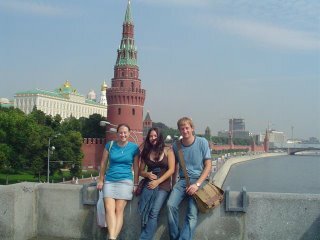 On Saturday, we are going to take a day-trip to Moscow. We are taking an express train which will take about 2 to 2 1/2 hours. 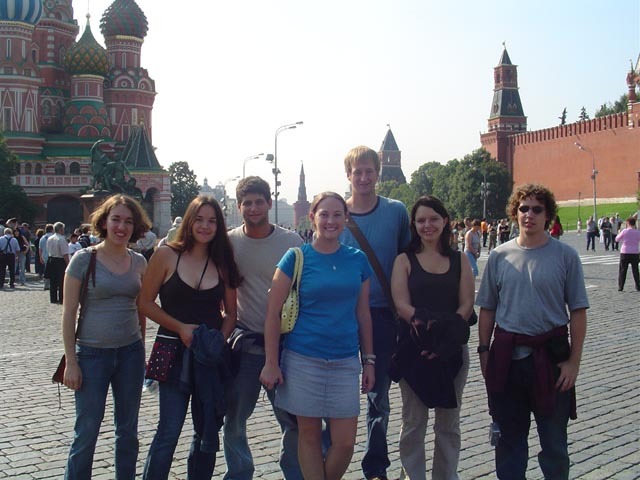 We have all been to Moscow, so we are looking forward to being able to avaoid the super-tourist areas. I hope to have lots of pictures and fun stories to post soon. Untill then...poka! Well, here comes the first post from Russia. The flight from Chicago on Wednesday wasn't too bad (i.e. I got an exit row!). After chilling in the airport in Warsaw for like four hours, reading a couple of magazines, having my carry-ons thouroughly searched by a Polish woman, and trying to figure out why all the flights to London were cancelled, I made it to the two hour flight to Moscow and the three hour drive after that. Let's just say I was wiped out by the time I got to my new home in Vladimir. My hostess is Nina Petrovna. She's retired and lives in a fairly large two bedroom apartment with two cats. She has hosted several other university students and English teachers before me, so it seems that she knows what to expect. Friday morning we met up at the American home, where we will be working. There are seven teachers. Molly, the eighth, will hopefully be here soon. Her passport and visa were lost and she is waiting to get them replaced. We have a veteran teacher, Joanna, who was here last year, five who are straight from college, and one who just finished with the Air Force. We also took a short get aquainted tour of Vladimir. There are a few buldings and churches that date back to the 12th century, but most of it dates from the late 19th and 20th centuries. It's pretty small and has not been much of a force in Russia since the Mongols showed up in February of 1238 and burnt the place down. I'll try to get some pictures and a history lesson up pretty soon. The people here seem pretty typical for Russia and for the most part my memeries of people from Petersburg apply here pretty well. I do feel like I am seeing more Western and American stuff like clothes, shoes, cars and other goods, but mybe I am just noticing those sorts of things more. 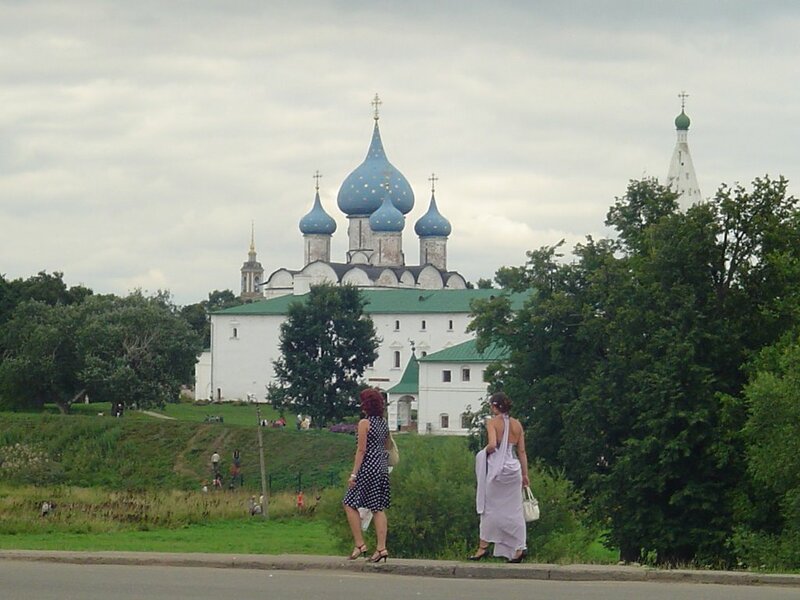 Saturday, we took a short trip to Suzdal, an ancient Russian city that dates back at least to the early 11th century. There are many churches, a convent, a monastary and there are lots of little fields and streams. It's very pretty and picturesque. Also, they were celebrating the anniversary of the town's founding, so there was a carnival and lots of people out and about. There were also several weddings with all of the things that go along with Russian weddings (taking pictures at various sites and cheering the bride and groom.) In all it was a pretty fun day. On the way back to Vladimir, we all crashed from jet-lag, but we revived enough to go explore the big western style grocery store that's about a block from the American Home. It is a little more pricey than the local Russian stores, but it has more selection and is set up more like a Western supermarket. 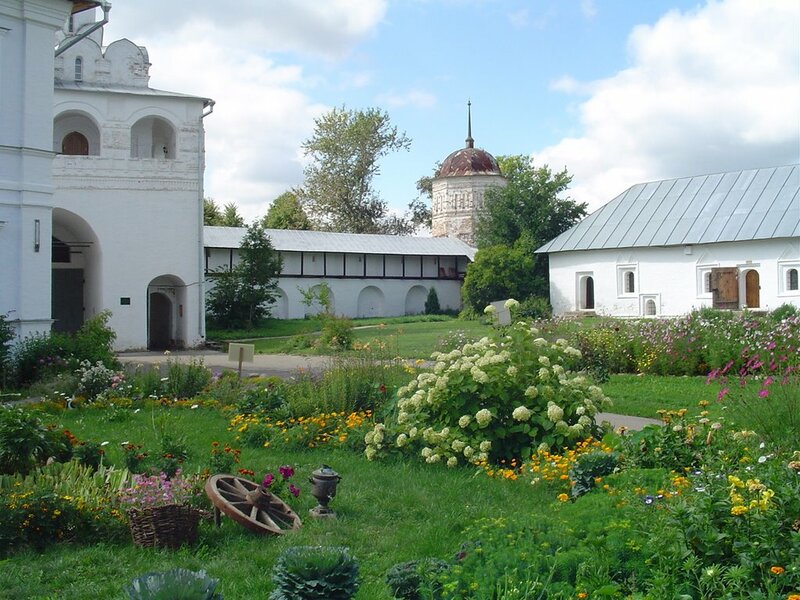 Hopefully I will get some pictures up from Suzdal soon and a few updates on how things are going. These next couple of weeks are going to be spent doing orientation and teacher training stuff, so there might not be some much exciting stuff to write about, but I will do my best. 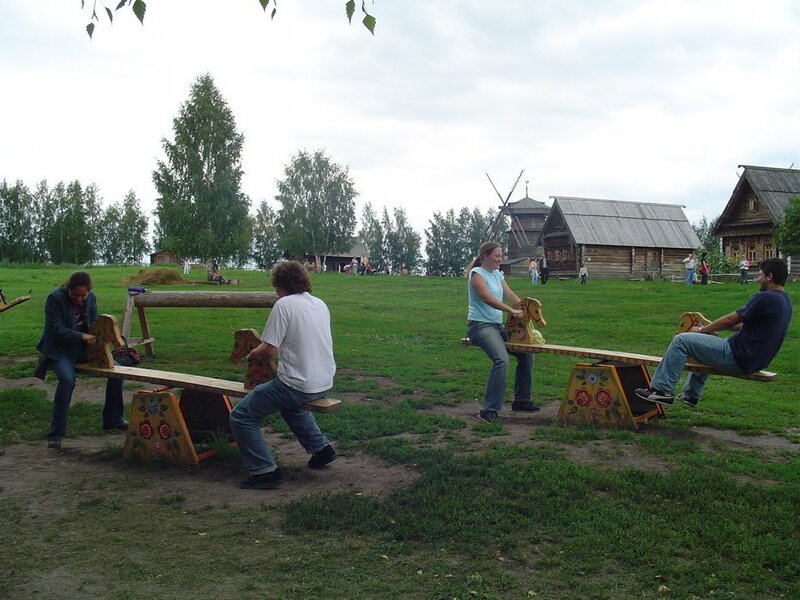 Update....As promised, a few pictures from Suzdal. First, the main cathedral of the town, Cathedral of the Nativity. 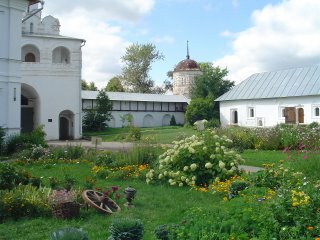 A flower garden inside a working convent, the Convent of the Intercession. And finally, some of our grown up teachers...on teeter-totters. Well, the big day is almost here. I leave a week from tomorrow from Chicago on my way to Moscow and to Vladimir beyond. I have been busy cleaning and storing my stuff, figureing out what to pack, and generally just doing all of the little stuff that has to be done. My Russian visa showed up this morning, which is a big load off my shoulders. I am trying to enjoy the last few by going to a ball game, visiting family, and spending some time in Chicago with my sis. The time will be gone before I know it!